Doesn't appear as though the op is discussing race or offroad only truck, so I assume we are discussing a truck that is primarily for Street use where someone is looking into power options. 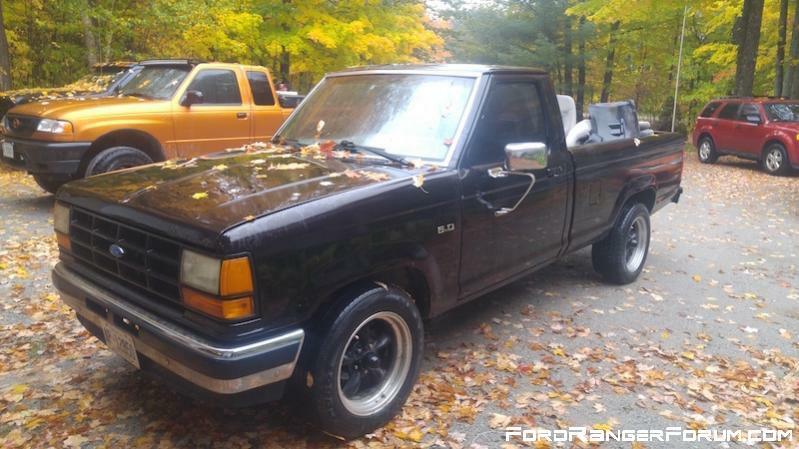 Never said I'd swap a 4cylinder turbo into offroad only truck. I'm not dissing v8 Rangers, I said there is a place they make sense and dont. As mentioned I've had v8 Rangers in the paste and I have answered the questions asked. Some of which require opinion. You don't like my opinion so be it, it wasn't mean to piss a bunch of people off. But it's how ever you want to take it. To the op I understood you were undecided. That is why my reply was short and simple without going into 3 pages of details. . If.you wanted more, I wpuld provide if asked (as I did) if you wanted to over look it, that was ok just the same. I can't persuade you one way or the other but you asked if anyone had anything else to ad, which i did. So, I was hoping some of those who have done their v8 swap can give us a follow up on what its like after the fact. How long ago was your swap done? Which transmission did you use? What things changed afterwards (fuel economy, etc)? aprox. how much did you spend total on it? and if you were to go back in time would you do it again? Its something I'm considering, and have been reading up on the threads, but few seem to follow up once the work is done, or if they do its on other mods. You should of read the OP's WHOLE post, not just part of it! I don't see in any of your posts ANYTHING to do with "Follow-Up" on a V8 swap and if you bought them that way then you ain't got any info on the swaps like the OP was askin for! I don't see where he was askin for anybodies opinion on buyin one or what they thought after doin so either. Re: V8 swap follow ups? I just wish I'd of started lookin for 98-01 Expo 5.0L AWD and 98up Ranger earlier! I did the whole conversion purchasing the truck Oct 15 & Expo in March 16 and completed the swap July 16.
i would do the swap myself the first time and do it right. the truck was swapped with the right components just the lack of wire cleaning, rust management and oversized hoses etc. i am now rebuilding the truck myself now. started oct 10/2016 and have a plan to finish by april. heres a couple of pictures, before the truck got stripped. and the state its currently in. Thanks for the updates! keep us posted on your progress! Increased power of course fuel econ suffered. I would get about 14 mpg in town to about 21 hwy, with the 3.0 manual trans. After the 5.0 auto trans swap that dropped to mid 7's in town and around 12 hwy. Something else, the front end started sagging from the extra weight to the point where it would hit the bump stops on the lca's, I expect it from original springs that have 230k miles on them. I still need to address front suspension but while I weigh my options in the mean-time I put lift spindles and body lift to keep the tires from rubbing. I bought a running donor explorer for $800 because the owner didn't have the title and interior was trashed, sold my complete engine for $500, the A/C system for $200 and misc other parts from the explorer (spare tire, rear window etc) to basically break even on cost. I may have even come out ahead even though I put new spark plugs and oil pan gasket and rear seal while it was out. the additional power allowed me to lift the truck and put bigger tires on it and still get around in traffic. I recommend you do it! I too would like to do the v8 swap soon. is there any reason in particular why people are using the explorer as the donor? i thought about using a full size bronco for my donor so that i can do the solid axle swap at some point. I have a 85 ranger 4x4 with a 6" lift. Last edited by ranger_dave88; 07-23-2017 at 01:31 PM. I too would like to do the v8 swap soon. is there any reason in particular why people are using the explorer as the donor? i thought about using a full size bronco for my donor so that i can do the solid axle swap at some point. Explorers use the same platform, so it's a direct drop in. Cuts out 2/3rds the work that most swaps require.